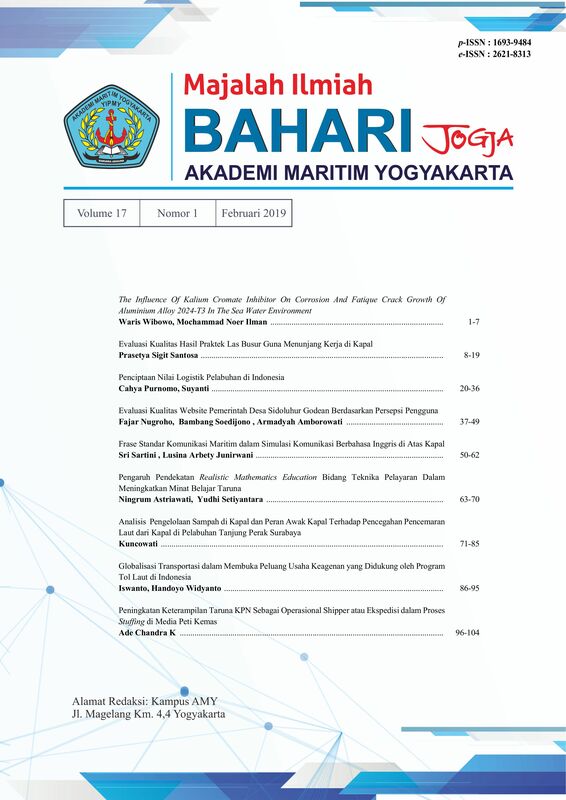 This paper highlights the creation of Indonesian ports logistics value, by review relevance journals. The finding are taht Indonesian ports faces problems, i.e policy concern to national logistics, transportation's infrastructure, availability of cargo, skill concern logistics. There are 3 (three) port logistics value : serial activity, pooled activity, and reciprocal activity. The activities of each actor in the port are getting better and better integrated. While there is no synchronization of flow of goods that enter and exit of the port. Almotairi, B. and Lumsden, K. (2009). Port logistics platform integration in supply cahin management. International Journal of Shipping andf Transport Logistics. Vol. 1 No. 2, pp. 194-210. Bichou, K. and Gray, R. (2004). A logistics and supply chain management approach to port performance measurement. Maritime Policy and Management. Vol. 31 No. 1, pp. 47—67. Bichou, K. and Gray, R. (2005). A critical review of conventional terminology for classifying seaports. Trasportation Reaseach Part A. Vol. 39 No. 1, pp. 75-92. Branch, A.E. (2014). Elements of Shipping. 9th Ed. Routledge, London. Brooks, M.R. and Pallis, A.A. (2008). Assesing port governance models: process and performance components. Maritime Policy and Management. Vol. 35 No. 4, pp. 411-432. Carbone , V. and DeMartino, M. (2003). The canging role of port in supply chain management: an empirical analysis. Maritime Policy and Management. Vol. 30 No. 4, pp. 303-306. Christopher, M. (2000). The agile supply chain: competing in volatile market. Industrial Marketing Management. Vol. 29 No. 1, pp. 37- 44. Christopher, M. (2011). Logistics and Supply Chain Management. Prentice Hall, Harlow. Cullinane, K. and Khanna, M. (2000). Economies of scale in large containerships: optimal size and geographical implications. Journal of Transport Geography. Vol 8, pp. 181-195. Cullinane, K. (2005). Editorial: key themes in shipping economics reseach. In Cullinane, K. (Ed). Reseach in Transportation Economics. Vol. 12 Issue 1, pp. 1-17. Cullinane, K. and Talley, W.K. (2006). Introduction. In Cullinane, K. and Talley, W.K. (Eds). Reseach in Transportation Economics. Vol. 16 Issue 1, pp. 1-10. De Martino, M., Morvillo, A., and Marasco, A. (2010). Value creation within port supply network: methodoligal issues. Paper Presented at 26th IMP Conference, 2-4 September 2010, Budapest, Hungary. Ferrari, C., Parola, F,. and Morchio, E. (2006). Southern European port and the spatial distribution of EDCs. Journal of Maritime Economics and Logistics. Vol. 8 No. 1, pp. 60-81. Glueck, W.F. (1980). Business Policy and Strategic Management. 3th Edition. Mcgraw-Hill, New York. Greenwood, R. and Hanson, S.G. (2015).Waves in shipping prices and investment.The Quarterly Journal of Economics. Vol. 130 No. 1, pp. 563-568. Hakansson, H. and Persson, G. (2004). Supply chain management: the logic of supply chains and networks. The International Journal of Logistics Management. Vol. 15 No. 1, pp. 11- 26. Harisson, A. and Van Hoek, R. (2008). Logistics Management and Strategy. 3rd Edition. Prentice Hall, Harlow. Lai, K.H., Ngai, E.W.T. and Cheng ,T,C.E. (2002). Measures for evaluating supply chain performance in transport logistics. Transport Reseach Part E. Vol. 38 No. 7, pp. 439-456. Lambert, D.M., Stock, J. R., Ellram, L .M. (1998). Fundamentals of Logistic Management. Mc Graw-Hill, Boston. Lambert, D.M. and Cooper, M. C. (2000). Issues in supply chain management. Industrial Marketing Management. Vol. 29, pp. 65–83. Lee, E.S. and Song, D.W. (2010). Knowledge management for maritime logistics value: discussing conceptual issues. Maritime Policy and Management. Vol. 37 No. 6, pp. 226-242). Marlow, P.B. and Paixao, A.C. (2003). Measuring port performance. International Journal of Transport Management. Vol 1 No. 4, pp. 189-202. Notteboom, T.E., and Rodrigue, J.P. (2005). Port regionalization: towards a new phase in port. Maritime Policy and Management. Vol. 32 No. 3, pp. 297-313. Ng, A.K.Y. (2012). Container liner shipping, port development and competition. In Song, D.W. and Panayides, P.M. (Eds). Maritime Logistics – Contemporary Issues. Emerald, United Kingdom, pp. 5 - 27. Ohmae, K. (2002). The Mind of the Strategist: The Art of the Japanese Business. Mc-GrawHill Education (India) Pvt. Limited. Paixao, A.C. and Marlow, P.B. (2003). Fourth generation ports; a question of agility ? International Journal of Physical Distribution and Logistics Management. Vol. 33 No. 4, pp. 355-376. Panayides, P.M. (2006). Maritime logistics and global supply cahins: toward a reseach agenda. Maritime Economics and Logistics. Vol. 8 No. 1, pp. 3-18. Radhika, A.D. (2012). The new role of seaports as integral parts of global supply chains. Excel International Journal of Multidiciplinary Management Studies. Vol. 2 Issue 4, pp. 131-144. Robinson, R. (2002). Ports as elements in value-driven chain system: the new paradigm. Maritime Policy and Management. Vol. 29 No. 3, pp. 241-255. Rodrigue, J.P. and Browne, M. (2010). International maritime freight transport and logistics. In Knowles, R., Shaw, J. and Docherty, I. (Eds). Transport Geographies: An Introduction. Blackwell Publishing, Oxford, pp. 1-22. Song, D.W. and Panayides, P.M. (2008). Global supply chain and port/terminal: integration and competitiveness. Maritime Policy and Management. Vol. 53 No. 1, pp. 73-87. Stopford, M. (2009). Maritime Economics. Third Edition. Routledge, New York. The Council of Logistics Management. (1993). Whats it all about ?. Oak Brook, Illinois. Valentine , V.F. and Benamara, H. (2013). Maritime transport and international trade. Maritime Policy and Management. Vol. 40 No. 3, pp. 226-242. Vitsounis, T.K. and Pallis, A.A. (2012). Port value chains and the role of interdependencies. In Song, D.W. and Panayides, P. (Eds). Maritime Logistics-Contemporary Issues. Emerald, United Kingdom, pp. 155-173. Wood, D.F., Barone, A.P., Murphy, P.R., Wardlow, D.L. (2002). International Logistics. Second Edition. Amacom, New York. World Bank Technical Team, (2005). The “Door to Door” Movement of Goods. Working Paper, July 5, 2005. Yercan, F. and Yildiz, T. (2012). International maritime trade and logistics, In Song, D.W. and Panayides, P.M. (Eds). Maritime Logistics - A Complete Guide to Effective Shipping and Port Management. KoganPage, London, pp. 23-42.